Thanks to years of clinical research and experimentation, dental implants are proven to be a safe and effective solution for tooth loss as long as they are placed by a licensed professional. Studies have shown them to have a success rate as high as 98 percent, even after 10 years of use. However, there are certain behaviors that can dramatically increase the risk of complications during the healing stage and after placement. Before your treatment, Dr. Sean Bannan will make sure that your oral health is in order and that you are eligible to receive implants. The more thorough the planning stage is, the more successful your treatment will be. Implants can fail if there is not enough bone present for the post to adhere to. Oral infections inside your soft and bone tissue can also make it extremely difficult for the implant to heal properly. If you use tobacco products, they can seriously affect your mouth and body’s ability to heal. 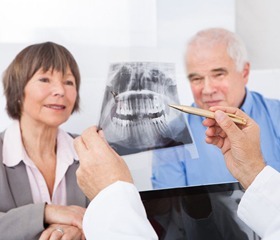 For this reason, Dr. Bannan strongly encourages patients to discontinue their use as well as have all oral health issues handled prior to surgery. Most patients only experience mild to moderate amounts of post-operative discomfort, which you can receive prescription medication for if needed. Dental implants are ideal for most patients with missing teeth, even if you don’t have sufficient bone volume at the start of treatment. If not enough bone is present, a bone grafting procedure, which is meant to expand the existing amount of present bone tissue, may be needed for implant preparation. 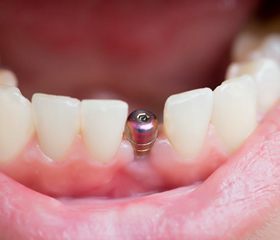 With that said, if you have relatively good oral health, no gum disease, and sufficient overall health (which is common for any type of surgery), implants are likely an ideal solution for your tooth loss. The length of your treatment will vary depending on a few different factors. 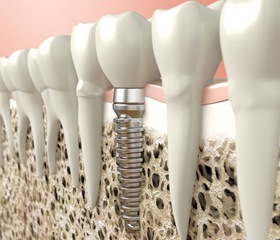 Those who choose All-on-4 implants can receive their restoration relatively quickly, while more traditional single or multi-implant treatments require several months of healing before a permanent restoration can be provided. If you need to have preparatory treatments done, this will extend the length of treatment as well. On average, patients need to go through four to six months of healing time prior to permanent tooth replacement. The best way to find an exact timeframe is to schedule an implant consultation with Dr. Bannan. 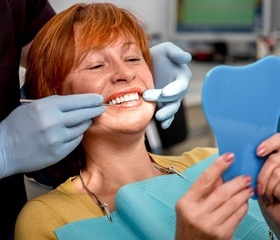 Can Implants Help Denture Users? Absolutely! Dental implants are extremely effective at making a denture more stable and appear more natural. By placing four to six implants throughout the jaw, we can replace an entire arch of teeth and reduce bone deterioration in the process. These implant-retained dentures can be designed to be fixed or removable, depending on your preference.